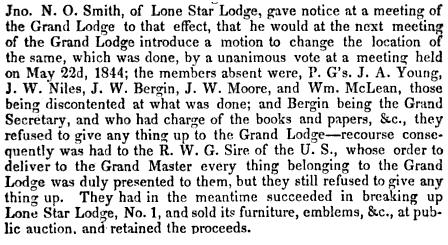 As a result of the above actions three members were expelled from the order, including PGM J.A. Young (the first Grand Master of Texas). He served in battle of San Jacinto as a Sergeant Major in the regular army. 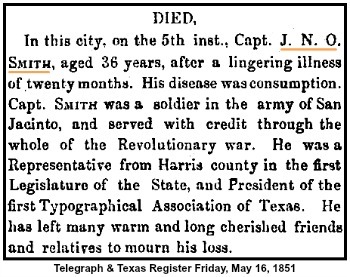 He was born in Massachusetts in 1815 and died May 5, 1851. It is not know when he arrived in Texas. He was married to Margaret Farrell. I have to acknowledge the receipt of your favor of the 9th inst., and at the same time to return you my thanks for the obliging expressions and good wishes which it contains. Believe me, Sir, when I say that in the discharge of the duties I have assumed, I shall ever be governed by a sincere desire to promote the interests and welfare of our country to the utmost of my humble ability. You will perceive by our prospectus, several of which I have forwarded to Dr. (D. C.) Gilmore, that we have adopted the title "The Citizen". Had I received your suggestion a few days earlier, I should undoubtedly have adopted some of the titles you recommended; and I now somewhat regret that I did not make a selection more apropos to a commercial community like ours, although, on the whole, I consider it of but little importance. Our prospects are sufficiently encouraging, if not to say flattering; and I anticipate that by the fall we should have a very considerable circulation - of the weekly paper particularly, which, you will perceive, we propose to publish at an unusually low rate, for papers of the size of Texas. The first number of our city paper will be published on Wednesday, I found the office, on taking possession, in a most miserable condition, and in order to get everything fairly to rights, I shall not be able to give as close attention to the paper for the first two or three weeks as I desire; so, of course, all contributions of a proper character will be at all times welcome, and doubly so at present.